A list of events happening throughout our region, with a emphasis on Easter weekend. The Tigard Egg Hunt at Cook Park is set from 9 a.m. to noon. The park is at 17005 S.W. 92nd Ave. Registration and check-in begins at 9 a.m. and cost is $3 per child. Starting times are as follows; Age 3 and younger: 10 a.m.; Ages 4 through 6, 10:25 a.m.; Ages 7 through 10, 10:50 a.m.
Children are asked to bring their own baskets. Everyone is invited to gather under Shelter No. 2 for crafts and a chance to meet the Easter Bunny. A panel will provide a free tax forum from 5:30 to 7 p.m. Tuesday, April 3, in the library of Tigard High School, 9000 S.W. Durham Road. Titled "Tax Season Scams and Reality," the public event will cover new tax laws, tips to remember when filing, the new W-2, and how to avoid tax season scams. The Oregon Department of Consumer and Business Services and Financial Beginnings Oregon are hosting the event. OnPoint Community Credit Union is sponsoring the event. The event is open to the public. Child care and light refreshments will be provided. The Tigard-Orenomah Lodge No. 207 of the Masons will host the 70th annual Easter breakfast, 8 a.m. to 12:30 p.m., Sunday, April 1, at the Tigard Masonic Temple, 13680 S.W. Pacific Highway, Tigard. Tickets: $7 adults; $4 youths 6 to 12; free for those younger than 6. St. Matthew Lutheran Church in Beaverton will host an emergency preparedness fair from 9 a.m. to 12:30 p.m. Sunday, April 15, at the church, 10390 S.W. Canyon Road, Beaverton. Organizers will provide tables and information for a wide array of first responders, to help residents to be better prepared in the event of a disaster. 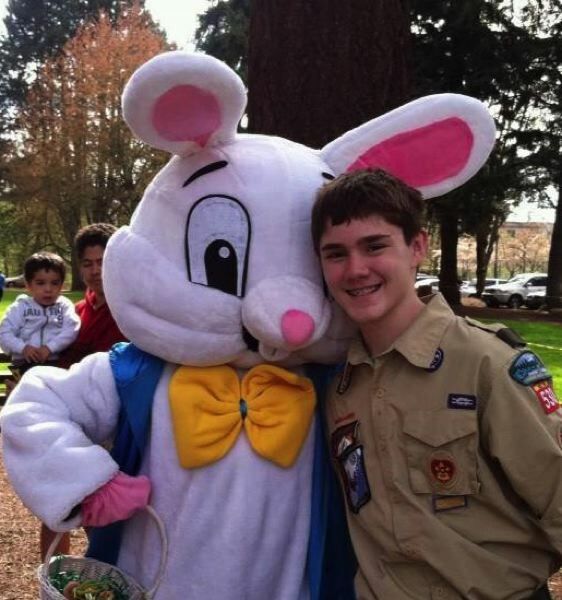 The Easter Bunny will team up with Boy Scout Troop 530 and the Tualatin Lions Club for an Easter Egg Hunt at 2 p.m. Saturday, March 31, at Tualatin Community Park, 8515 S.W. Tualatin Road. This is the 45th year for the event. Hunts will be separated by age groups, with the "Toddlers to Twos" hunts in the play area behind the picnic shelter. The "Threes and Fours" hunt will be in the volleyball field just south of the Lions' barbecue structure. "Fives and Sixes" hunt in deep left field of the main softball field. The "Sevens and Eights" hunt in shallow left field. Scouts from Troop 530 will assist the Lions. The Tualatin Cracker Barrel restaurant is providing prizes and coupons. Organizers will accept any non-perishable food donations for the Tualatin Schoolhouse Pantry and will be selling popcorn, soda and water with proceeds going to scholarships to the Tualatin Police Summer G.R.E.A.T. Camp. The Tualatin Lions meet on the second and fourth Thursdays of the month at 6:30 p.m. at the Tualatin Island Greens Golf Center. The Vault Theater in Hillsboro has announced a presentation of the Northwest Film Center's Best of The 44th Northwest Filmmaker's Festival, featuring a juried cross-section of film shorts from across the Pacific Northwest. The tour is part of The Vault's "Films For Five" series that lets audiences experience the finest in art-house, and popular, films for only $5 a ticket. The selection of short films will be shown at 7:30 p.m. Friday, April 13, and Saturday, April 14. The short films include "Vestibular Matching Soundtrack" by Beaverton filmmaker McKenzie Blake; "Culture Trauma" by Portland filmmaker Jodi Darby; and "A Mew Hope" — featuring a starship pilot and her cat who must escape an army of soldiers from a pug-dog planet — by Portland filmmaker David Koesters. Eight award-winning short films are showcased each evening. At 2 p.m. Sunday, April 15, The Vault gives younger filmmakers their turn with a screening of Fresh Film NW, the Northwest Film Center's youth component, features a showcase of teen-produced short video work in a variety of genres. The juried screening is an annual opportunity for young filmmakers from Oregon, Washington, Idaho, Montana and Alaska, aged 13 to 19, to have their work viewed by professional media artists and educators and presented to the public. The Vault is at 350 E. Main St., Hillsboro. National Library Week is April 8 to 14 with the theme "Libraries Lead." Library advocates are asked to share how the library led them to something of value in their lives, such as a new interest or skill; a love of learning; or community connections. Post to Twitter, Instagram, or on the "I Love Libraries" Facebook page during National Library Week for a chance to win a $100 VISA gift card and a copy of "Firebird," the Coretta Scott King Award-winning book by Misty Copeland, 2018 National Library Week Honorary Chair. Use hashtags #NationalLibraryWeek and #LibrariesLead. Washington County Commissioner Bob Terry will speak to the Southwest Corridor Republican Club in April. The event is set for 6:30 p.m. Wednesday, April 11, at the King City Clubhouse, 15452 SW 116th St, King City. Terry is a businessperson, volunteer, former president of the Hillsboro Chamber of Commerce, founder of the Oregon International Airshow and a county commissioner who is running for chairman of the Washington County Board of Directors in the May primary. Doors open at 6:30 p.m. with the program at 7 p.m. at. For more information, call 503-639-7452 or 503-639-6545.